“The last section of my book is a compilation of the best advice I have gathered throughout the years. 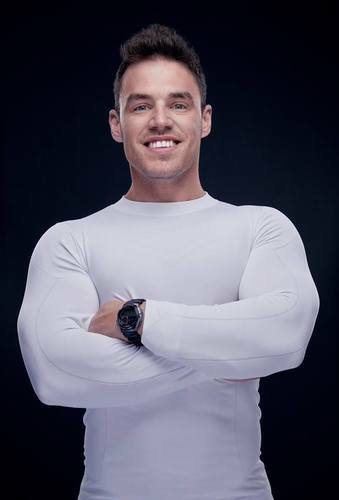 Former fitness model and health expert Brian Keane, from Galway, Ireland, has punched his way to the top of the Amazon charts with his new book ‘The Fitness Mindset', where it has remained at number one in the nutrition category for the past eight weeks. In his book, Brian offers a huge range of hints and tips to help readers achieve and keep the body they want. Brian also has a passion for living life to the full. He believes his success has been shaped by the ‘Ten Life Lessons’ he follows on a daily basis. Wherever you decide to go, go 100%. One of the life advices I would give to my younger self would be, “Once you know what you want, go after it with all of your heart.” Today, I make all my life decisions on the simple premise that it’s either a ‘Hell, yes’ or it’s a ‘No’. If it doesn’t excite me, I don’t do it. If it does, I’m all in. Everything and everyone has beauty, but not everyone sees it. If someone has annoyed or been rude to you, you may perceive them as ‘being rude’. Rudeness, like most things that annoy us, is an action, not a characteristic. Learn to separate the thoughts of what they’re doing as an action and not who they are. They may be just having a bad day and it’s not a reflection on their character – and definitely not a reflection on you. It doesn’t matter how slowly you go, as long as you don’t stop. It doesn’t matter how slowly you are moving forward towards the life, mind or body you want, as long as you’re moving in the right direction. You will eventually get to where you want to be. If you think you have all the answers, you haven’t asked all the questions. One of the miraculous beauties of life is that we will never know it all. Things change, ideas change, science changes – we are creatures constantly evolving. Remember, people once thought the world was flat. Life really is simple, but we insist on making it complicated. Find the things that make you happy, do more of it. Find the things that make you unhappy, do less of it. If you hate somebody, that’s on you, not them. Hate, like every other human emotion, is nothing more than a manifestation of thought – you control it. Hate puts your mind into a negative place, where the mere association of the person you associate this feeling with can destroy you as a person and your underlying happiness. As human beings, we have put a man on the moon. Next time you try to ‘get down four dress sizes’ or ‘get abs for the summer’ and wonder if you can do it, remember that as a species, we have put a man on the moon. One of my biggest goals in life is to instil the feeling of self-worth and respect into my daughter. I would trade every single thing in my life to make sure my girl grows up with confidence and self-respect. I truly believe that respecting yourself gives you the confidence to be truly happy in life. How can anybody else respect you if you don’t respect yourself? What the happy person looks for in themselves, the unhappy person looks for in others. Happiness comes from within, it’s not a tangible thing. A nice car, a new house, an attractive partner – none of these things in themselves bring true ‘happiness’ or ‘fulfilment’. They’re external sources that can be taken away with a blink of an eye. Learn to find the happiness from within and you will always be happy. Study the past if you want to define the future. Learning from other people’s mistakes or triumphs can allow you to create any life that you want. If you want to have more energy, sleep better, have the body you always wanted, or be the person who has the confidence to stand tall in any room, then consume every bit of information that supports that vision. Brian Keane’s new book, ‘The Fitness Mindset’, published by Rethink Press, is available to order on amazon at £11.99. The book reveals the best tips and strategies improve your health, lose weight and maintain the mindset to reach your body goals. Brian Keane is available for interview. If you would like to speak to Brian please contact Adam Betteridge at Famous Publicity at adam@famouspublicity.com or Mary-Jane Rose at Mary-Jane@famouspublicity.com or Tina Fotherby at tina@famouspublicity.com or call the office on 0333 344 2341. Author of new book ‘The Fitness Mindset’, Brian Keane is a fitness trainer, former professional fitness model and the owner of Brian Keane Fitness. He has an impressive online following with over 62,800 Instagram followers, 66,500 Facebook fans and hosts one of the top fitness and nutrition podcasts on iTunes. ‘The Fitness Mindset’ book, launched this Summer, incorporates 17 years of his training and nutrition experience with nearly 30 years of his life journey. The first section of the book focuses on how to get into shape and achieve body goals. The second section provides advice on dealing with problems such as anxiety, stress and worry. Crucially it shows readers how to maintain fitness by changing their mindset. This press release was distributed by ResponseSource Press Release Wire on behalf of Brian Keane Fitness in the following categories: Children & Teenagers, Men's Interest, Health, Leisure & Hobbies, Women's Interest & Beauty, Sport, Food & Drink, Business & Finance, Education & Human Resources, for more information visit https://pressreleasewire.responsesource.com/about.